Injen Super SES - Universal Muffler UNIVERSAL - Lightning Motorsports - Selling Speed since 1996 ! 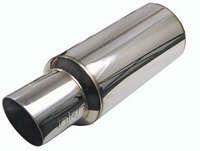 Injen Technology’s Super SES Universal Muffler is manufactured from 100% 304 stainless steel. Add that Injen Technology to ANY custom exhaust, Turbo or NA, and experience the Injen difference.